Some people truly believe that being wasteful is a horrible thing, and they can become frustrated with people who do not recognize this. In some cases being wasteful is selfish, while other times it is inefficient. Others don’t do this intentionally but they might not be completely focused on things in a way that helps them avoid being wasteful. 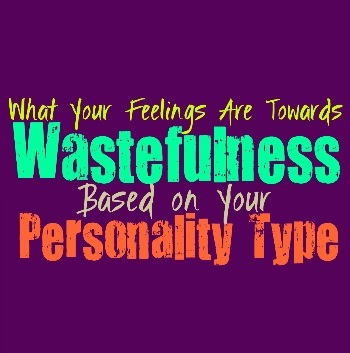 Here is how you feel about wastefulness, based on your personality type. Most of the time INFJs can be bothered by too much waste, since they are conscious of others. Sometimes wasting makes the INFJ think of what they could be giving to someone else, and how inconsiderate that is. They care about the world around them and don’t like showing a sense of selfishness or lacking compassion. They also find themselves witnessing large scale wastefulness, and this can really bother them. While they care about others and don’t directly like being wasteful, there are times when they might lose track of something or become caught up in their own minds, but this is not intentional. ENFJs don’t tend to like wastefulness and can become upset when they see it on larger scales. They care about people and the state of the world around them, and so when they witness waste it makes them think of the people missing out. They care about people and want to do what they can to provide for them and make them happy. For the ENFJ being wasteful means not considering others and it certainly feels selfish. It can also be something that is inefficient, since they aren’t utilizing things to the best of their ability. For the ENFJ wastefulness is something that should certainly be avoided at all costs. While INFPs might consider wastefulness and how harmful it can be, there are times when they struggle with it themselves. They become so easily distracted and their minds are so busy, that sometimes it causes them to lose sight of the present moment. When the INFP is distracted they definitely find themselves wasting things, since they just aren’t aware of the physical world all that much. INFPs do have wasteful tendencies, but they also regret this sometimes. For them it is worse when there is wastefulness on a larger scale, rather than the smaller things they tend to waste. ENFPs don’t enjoy being wasteful, but they do become distracted rather easily. The fact that the ENFP has such a busy and overactive mind, can draw them away from things sometimes. They find themselves distracted from the world around them, and this causes them to accidentally waste certain things. They might even find themselves bouncing on to something new, and so they might be wasteful in these situations. ENFPs don’t like doing this, since they do care about others and being conscious of them, it just tends to happen unintentionally. INTJs tend to steer away from wasteful behavior, since it seems foolish and lacks a sense of direction. They do everything with intention and being wasteful isn’t something they intend to do. For the INTJ sometimes wasting things also shows a sense of inefficiency and keeps them from being able to really utilize everything to the best of their ability. For the INTJ being wasteful is rarely something they find themselves doing, especially in situations where it can be easily avoided with a bit of effort and focus. ENTJs definitely don’t appreciate being wasteful, especially when it comes to things that matter to them. They believe in being efficient and this also means avoiding waste in situations where it can be avoided. For the ENTJ doing things that prevent them from really getting the job done, is not something that interests them at all. They strive to be focused people who can handle their own, and so this definitely means avoiding waste whenever they can. ENTJs also tend to be annoyed with people who waste often, and might find this rude. INTPs don’t necessarily appreciate being wasteful, but sometimes they can fall into this themselves. They become so caught up in their own thoughts and inner minds and so sometimes they find themselves wasting things. INTPs aren’t always conscious of the physical world, mostly because they become distracted by things that are intriguing to them. When the INTP goes into their own bubble it can be hard for them to really focus on avoiding wasteful behaviors, even if they regret it later on. ENTPs don’t favor wastefulness by any means, but they do have a tendency to be wasteful themselves. This is only because the ENTP becomes so distracted and finds themselves drawn to something new because of this. They have truly active and analytical minds, and can become drawn into their own bubble for long periods of time. When this occurs the ENTP finds themselves struggling to really recognize what is happening around them. ISTJs definitely don’t believe in being wasteful, especially since they are often frugal people. They are conscious of their actions and don’t like doing anything without intent. For the ISTJ being wasteful is often rude, and it lacks a sense of personal accountability. They believe in being able to get things done efficiently, without wasting when it simply isn’t necessary to do so. For the ISTJ it is important to be focused on what is important to them, and not become distracted. ESTJs are definitely against wastefulness and often believe in being as efficient and mindful of their actions as possible. When it comes to being wasteful the ESTJ often sees this as rude and inconsiderate. They are often very frugal people as well, and being wasteful shows a lack of understand on how much things cost. For the ESTJ being efficient is important, and in many situations being wasteful and not utilizing everything they can, is rather inefficient as well. ISFJs are rarely wasteful people, and often find this rather upsetting. They prefer to be conscious of their actions and also considerate of how they might affect others. For the ISFJ it is often rude to be wasteful, especially when they are someone else’s guest. They do their best to conserve and take care of the needs of those around them. ISFJs also recognize that being wasteful is often taking away from others in some ways, and so they don’t like doing this. ESFJs do their best to avoid being wasteful and often find this truly upsetting and even a bit selfish. They believe in always being conscious of their actions and strive to take care of those around them. For the ESFJ being wasteful often means lacking consideration for others, and how their actions affect people. They don’t’ like doing anything that takes away from others or makes their lives more difficult, and so being wasteful is included in this. While ISTPs might have moments where they try not to be wasteful, they can find themselves caught up in different things. There are times when their desire to live in the present can prevent them from focusing on certain things. ISTPs usually try to avoid being wasteful, but they are strongly independent people. If they don’t really care much about what they are wasting, the ISTP just isn’t going to become overly upset about this. ESTPs try not to be wasteful but at the same time they become easily distracted. There are times when they lose interest in something or become drawn in a different direction and this can certainly cause them to be more wasteful. ESTPs can become so caught up in seeking out the things which fulfill and excite them, and so sometimes they do become wasteful. They don’t intend to be this way, they simply find themselves more interested in other things and don’t always pay attention. ISFPs can sometimes be wasteful people, but only because they become distracted. ISFPs become so caught up in their thoughts and seeking out new things, that they might find themselves wasting the old things. For the ISFP it is important to seek out the things which bring them joy, and so this means leaving behind certain things. They follow their heats wherever they might lead, in some cases this means being a bit wasteful of the things they no longer want in their lives. ESFPs do have moments where they are wasteful, simply because they are so caught up in the moment. They want to enjoy themselves and have fun, and don’t like feeling forced to consume or use something that they no longer want. This causes the ESFP to be a bit wasteful when they lose interested in something and are more excited about something new. They also find themselves constantly trying new things, sometimes things they find they don’t actually like.